Since my last article, I’ve had a number of emails thanking me for clarifying what an intermediate player was in my eyes. 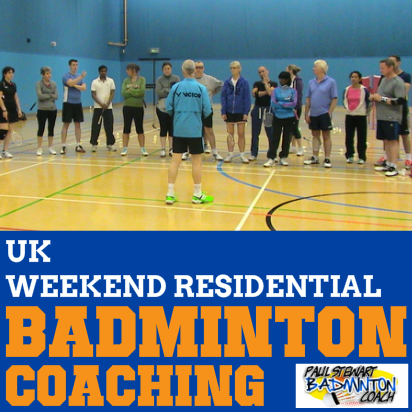 This was important to many players who wanted coaching and yet thought my residential weekends were only for advanced badminton players. The truth is we see the biggest breakthroughs from intermediate players than we do advanced players. Why? 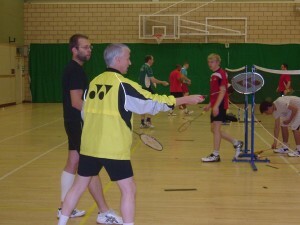 With advanced players they already know a great deal about badminton and they’re already playing at a high level. Yes, they learn many new things over the coaching weekend including advanced techniques and possibly a little more about strategy and tactics. They also learn more about their own strengths and weaknesses because we push them harder, at times almost to breaking point to find the one key area their good technique is weak. They also learn about their bad habits and work to correct them. Intermediate players have less knowledge of the game. Because of this, their skills are also limited. But this does not mean they cannot massively improve. The truth is, once the skill is unlocked, this is closely followed by rapid improvement. Let’s take a step back for a moment and look at the fundamental issues here. I began these courses because there seemed to be so little coaching in the market for senior players. All I was finding was a wealth of coaching availability for junior players and very little else. It seemed to me that the coaching fraternity had almost placed you on the scrap heap if you were aged 18 and over. So what about the player aged twenty something, thirty something, forty something or older? Why is it that there’s so little for you when you have the desire to improve and the ability? After all, you just want a chance to learn new things and implement them at club night and in league matches. It’s great that you’re not content on what you can do on a badminton court now, and continue to strive in a club environment to be better, play on a higher team or just continue to play when the younger players are being given a favourable look at your team place. For some, you just want to learn how to beat your friends at the local sports centre. And that’s OK too. Whatever the reason you have for looking to improve, I wanted to give older players the opportunity to delve into a wealth of coaching talent and discover what they are capable of with 12-13 hours help. During 2010, we launched our residential courses and each time collected valuable feedback from every player which we acted on. 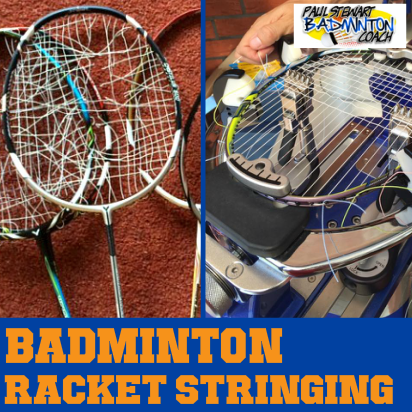 Each course is a step on from the next in terms of us doing things better and this will continue to be an on-going quest so that you get the ultimate badminton coaching experience. The first element in the construction of the course was the number of attendees. 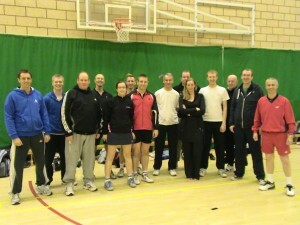 On the first course we had 18 players and 2 coaches including myself. Whilst the course went very well, I wasn’t happy. I loved working with the players but, I hadn’t enough time to spend personally with each player to help them more. This was corrected in the second course. Despite having less attendees I still insisted on finding another good coach, which then allowed me to do more both in groups and on a more personal level. And yet I still wasn’t happy. I still felt there was more we could do to help the players learn faster and lock in the new skills. So, for the next residential badminton course in March, I’ll be introducing more changes to speed up player’s development at every level. One of the key issues for me at the outset was ensuring that we were not running the courses purely on a numbers basis. Others can do that but that’s not what is important to me. Yes, we could have taken on 32 players as we had the space. 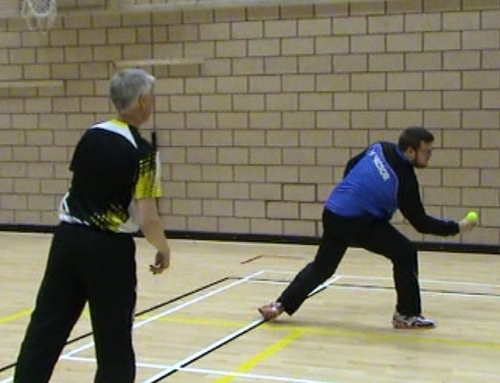 With 8 beautiful wood sprung badminton courts to play on, it was easy to accommodate the numbers. But, could we really have given you the attention you deserve and desire? I don’t think so. It would have been great from a business perspective to have 32 paying players on court. We could have made a reasonable profit. But, it was more important to me to establish the credibility of the coaching, sending players home with a bunch of skills and thoughts they hadn’t arrived with. This was, and still is my underlying, heartfelt goal and I won’t be tempted to the “dark side” by the lure of money. Quality is imperative. It’s important to deliver this in so many areas relating to these courses. 1) Information provided before you arrive on the course. We’ve listened to your feedback and consider our information pack, emailed two weeks prior to the start of the course, tells you everything you need to know to find and about the venue. 2) Our communication from the first date you make an enquiry. Overall, emails are answered within 24 hours unless we’re away, so that you get the answer you require quickly. 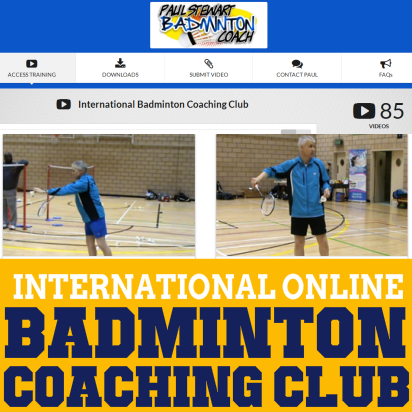 Occasionally, I’ve telephoned applicants to get to know more about their badminton needs to ensure we can deliver everything they’re looking for and more. 3) The venue. As a sporting venue, Lilleshall has it all. The main building, once a manor house, has a certain feel to it. There’s usually plenty other athletes there from many different sports e.g. GB Gymnastics Team etc. It gives a nice feeling of being in a multi-sport venue. The rooms could be better. They’re basic, but there again, most of the weekend is spent on court, in the food hall (very nice food too) or in the bar. 4) Shuttles. This is perhaps the area where we can also define quality best. Players who read my blog and forum posts know I am fanatical over shuttles. I’ve lost count of the number of brands I’ve tested. I don’t just hit them, I speed test, I test for consistency and I then dissect the shuttle to see what’s inside the base. Is it true cork or a composite and small amount of cork – it makes a difference. Having done all of this testing, I only choose what I consider to be excellent shuttles. That’s why I choose Yonex Aerosensa 40 shuttles. If we had the budget, I would buy Aerosensa 50 shuttles but frustratingly, they’re just that little bit too expensive for our budget. As players will testify many times over, you do not pay to come on my residential course to hit lousy shuttles. I know of many horror stories relating to other residential courses where players spent too much time complaining about the shuttles. At the end of the day, you come on a course to learn. To do this, you need to hit good shuttles. Even our knock up shuttles are in good condition and equal or better than some clubs match shuttles. This is not a boast but based on a comment by a former attendee. Some of the players commented to me how delighted they were when we opened the box of shuttles to reveal the Yonex brand. Without doubt, aside from the cost of the venue, shuttles are the biggest cost to the weekend. And I won’t compromise. I’d rather put the price of the course up a few pounds rather than change to a lower grade shuttle. 5) The other aspect of the course that defines its quality is the coaching program itself. Whilst we cover a lot of topics over the weekend, the emphasis is always on development of skill. It doesn’t matter if we leave a few topics out. After all, it’s impossible to cover every aspect of the game in a weekend. However, we now cover less topics but go deeper ensuring each player has a more thorough understanding of the topic and has improved considerably before we move on. 6) That’s asking a lot from the coaches. And that’s why I choose my assistant coaches carefully. I look for coaches who demonstrate a keen eye for detail and have a full understanding of the techniques and mechanics needed to perform certain skills. They also have to demonstrate the right personality to me i.e. their love and enthusiasm for the game, a can do attitude and most important, they do not possess an ego with a “I know something you don’t“ attitude. I know this is a long post. 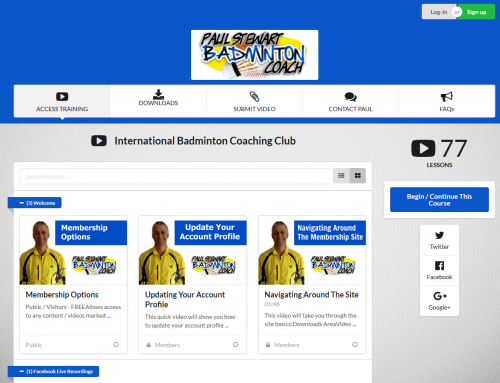 But, it’s about time I really talked about the main drivers behind these badminton weekends and also the care that happens behind the scenes, before the first shuttle is hit, to ensure that you as an attendee or potential attendee understand that this is not just another “me too” badminton coaching course. It’s way more than that. It’s an experience designed with your personal goals, hopes and sometimes dreams attached. It’s a journey to a place where you leave knowing you’ve taken a thousand steps towards becoming the badminton player you aspire to be. You may even reach that goal in the weekend. With certainty I can say that it won’t be through our lack of trying. When we achieve that for you, then my reward is knowing that it’s been worthwhile for you. Players will testify that on my closing speech before they leave I’m close to tears. That’s because all that I have to give is done, and I’m so delighted and in awe of the transformations that have taken place. That’s the dream I had for these players and it’s such a privilege to witness the amazing changes over the weekend. Aren’t I lucky! 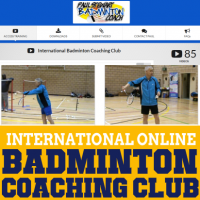 Physical Training in Badminton to Increase Your Vertical Jumping Power?